Kate Richards O’Hare (a.k.a. “Red Kate”) was the first “important” figure to be indicted under the Espionage Act. She was born in 1876 on a farm in Ottawa County, Kansas, and spent some time as a schoolteacher and bookkeeper before becoming a machinist’s apprentice. As a result, she was one of the first female members of the International Association of Machinists. The young Richard's was also deeply religious (Campbellite Disciple of Christ) and active in the Florence Crittenton Mission and Home and the Kansas City Crittenton Mission. Her sympathies were particularly directed toward the problems of alcoholism and prostitution. She also began to familiarize herself with the writings of Henry George and attended union meetings. But the critical event in Richard's life was a dance, which featured a speech by the legendary socialist Mary Harris “Mother” Jones. The seventy-year-old Jones referred Richards to other prominent socialists and she joined a socialist group. In 1901, she enrolled in the first class of the International School of Socialist Economy, a “training school” for Socialist party workers. One year later, Richards married one of her twenty-four fellow students, Frank P. O’Hare. It actually took the two young socialists all of four days to realize that they were meant to be married (they divorced in 1938). Mrs. O’Hare’s fame and popularity as a socialist speaker increased considerably. She was soon considered second only to Eugene V. Debs so, in 1910, a run for public office only seemed logical. O'Hare was actually the first woman to ever to run for Congress in the state of Kansas. Three socialists were already in the state legislature, but O’Hare gathered a mere five percent of the vote in a four-candidate race. She later ran for a position on the board of education in St. Louis and became the first woman to run for the United States Senate. O'Hare also ran for a seat in the Missouri state legislature. But the popularity and interest generated by her public speaking never seemed to translate into high levels of support in voting booths. O'Hare published a socialist novel entitled What Happened to Dan? in 1911 (later named The Sorrows of Cupid) and, the following year, she was elected to the National Executive Committee of the Socialist Party. In 1913, she was also selected to represent the party on the executive body of the International Socialist Bureau. In June, 1915, "Red Kate" predicted America would declare war on Germany and encouraged American mothers to become antiwar activists. She also attacked the Espionage Act knowing agents of the Department of Justice were, in her words, “always on the job.” On July 17, 1917, she delivered a speech at the Cozy Theater in Bowman, North Dakota. The exact speech was eventually delivered in various places more than seventy times. She was quoted as having said women of the United States “were nothing more nothing less than brood sows, to raise children to into the army and be made into fertilizer.” O’Hare denied she made the offensive remarks but was arrested twelve days later and indicted under the Espionage Act. She was charged with interfering with the war effort by obstructing recruitment and enlistment in the armed forces. The case was certainly not helped by the fact that O'Hare had also written an essay two years earlier (“Breed, Mother, Breed”) which portrayed women as being placed in “breeding pens.” Biographer Sally M. Miller notes the jury selection process was more than a little detrimental to the chances of avoiding conviction. According to Miller, the all male jury consisted of established businessmen who were “heavily” Roman Catholic and certainly not socialists. The trial, which began on December 5, 1917, was highly publicized. O’Hare took the stand to defend herself and the prosecution warned jurors that she was “shrewd and brainy.” The jury's verdict was a quick, unanimous, “guilty.” O’Hare was sentenced by Judge Wade on December 14, 1917. The New York Times reported that the sentencing hearing featured a “long speech” in which O’Hare “defied” the court. But, the Times failed to note that Judge Wade had long speech of his own. And he gave it to O’Hare before he sentenced her to five years in the federal penitentiary. Frank O’Hare immediately organized the “Liberty Defense Fund” to raise funds for appeals and a release. The Circuit Court of Appeals affirmed the conviction in October of 1918, however, and the Supreme Court denied a request to give the case receive further attention in March of the following year. Meanwhile, a millionaire provided bail, so O’Hare was free for a year and a half before finally entering prison on April 15, 1919. In that space of time, she undertook a nationwide lecture tour. Every stop on the way featured government agents and curiosity as to whether or not she would actually be allowed to speak. The possibility of an offense and/or and arrest may have, in itself, attracted thousands of spectators and the national news media. Before O'Hare finally stepped behind bars, she said that she had nothing to regret, retract, or apologize for. She described herself as "calm, serene and unafraid" and certain that she would "rise above it all." Her fate and the fate of her four children would be fine, but she added that she trembled for the fate of her country. In the prison at Jefferson City, Missouri, O’Hare (or prisoner number 21669) raffled off her scarves and befriended Emma Goldman, a fellow prisoner. Somewhat predictably, the state of O'Hare's cell, prison work requirements and prison food gave rise to a passionate interest in prison reform. In less than a month, O'Hare was professing to have a better understanding of Jesus and bemoaning the "malignant hatred" and "venom" of Judge Wade. Eight months into her five-year sentence, she considered herself to be living the "life of the damned." 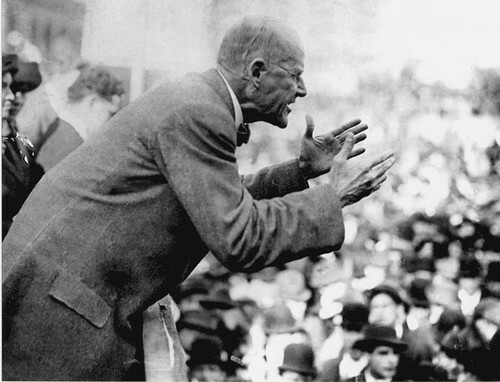 A Socialist National Convention had called for the release of both O’Hare and Eugene Debs, but O’Hare never sought or requested a pardon from the "utterly batty" Woodrow Wilson. In her mind, a pardon would imply guilt. She was, however, witty (and flexible) enough to warm to the notion of a commutation of sentence. Kate and her husband also worked for a general amnesty for Socialists party members who were being detained as “political prisoners." Miller states that an “orchestrated effort” resulted in a “steady flow of demands" for O'Hare's release in the Department of Justice. The Editor of the St. Louis Dispatch and the Governor of North Dakota supported release. But the idea was also opposed by Judge Wade, branches of the American Legion and the American War Mothers and many individual letter writers. On May 14, 1920, members of a Socialist party delegation met with Attorney General A. Mitchell Palmer, the Assistant Attorney General and the U.S. Pardon Attorney. Palmer, disagreed with the delegation’s view that O’Hare was a “political prisoner,” but suggested that the time may very well have come for O’Hare’s release. She was, after all, a woman and a mother! And, two weeks later, Palmer recommended clemency to the President of the United States, describing O'Hare as a “sincere, earnest, and worthy woman” despite her “distorted and erroneous views.” President Wilson then commuted O’Hare’s five-year prison sentence after she had served a little over one year. O’Hare sprang from prison and immediately began a nationwide "welcome-home" tour that featured crowds of thousands. 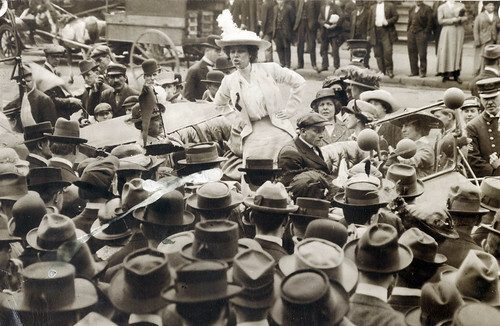 She also campaigned vigorously for the release of Eugene Debs (whose prison sentence was eventually commuted by Warren Harding) and organized the so-called “Children’s Crusade,” a much publicized march on Washington in 1922. As the “Crusade” went from city to city, additional families were added, but the group of thirty-seven women and children that actually reached Washington were not allowed to visit with President Harding. By 1924, O'Hare was again engrossed with the issue of prison reform. In New York, she told listeners that the prisons in the United States were the “worst in the world.” She also shared horrible stories of women prisoners being thrown into dark and damp dungeons. O’Hare speculated the “prison of the future” would not be made of “brick walls and iron bars,” but would instead be place of “sunshine and fresh air.” In her judgment, ninety percent of those in prison were there because of offenses committed against property. Fifty percent of them, in her estimation, could also be performing useful work under institutional direction. Calvin Coolidge granted Kate Richards O’Hare a full pardon in January of 1926. She was later active in Upton Sinclair's "End Poverty in California" campaign for the governorship and became assistant director of the California Department of Penology. She died of a heart attack in 1948.